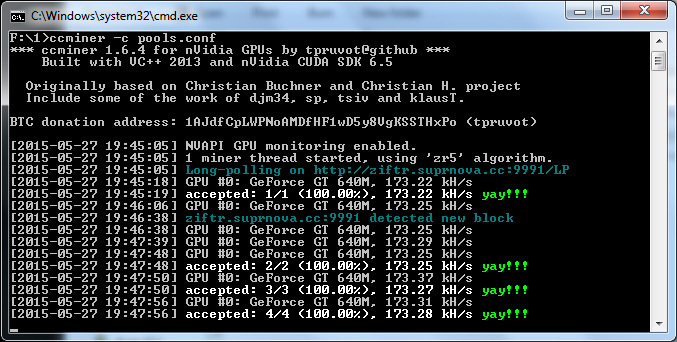 We have compiled a new up to date Windows binary from the latest ccMiner 1.6.4-git by tpruvot (source). The latest version includes implementation to support multiple pools with automatic switching if connection with the pool is interrupted (failover and time rotate). The API has also been updated to allow remote pool switching and pool stats. Do note that this new version drops support for the Whirlpool and Whirpoolx algorithms. Our windows binary is compiled with VS2013 and supports Compute 3.0, 3.5, 5.0 and 5.2 GPUs, but note that not all algorithms may work on older GPUs. You can download and try it below, there is an example BAT file setup for testing the multiple pool support.